Beginning April 24, we’ll have cut the field of 64 Northwest porters to the Sweet Saccharification 16. April 26, it’ll drop to the Ethanol 8. April 28, we’ll announce the winner of the Peaks and Pints Tournament of Beer: Northwest Porters — picked by you, of course — at our little lodge in Tacoma’s Proctor District. On that Saturday, we’ll cut the online voting at 5 p.m. and take the vote live in house, handing out ballots while you enjoy the final two porters on draft. That’s all fine and dandy, but it’s Thursday and you don’t have time for idle chitchat. You have reports to file and kids to pick-up. OK, OK, here’s a recap of yesterday’s battles, and a look at today’s Tournament of Beer action. Thanks for voting! Black Raven Brewing and Airways Brewing. Few incomplete sentences in Tournament of Beer history come with more buzz. A half-hour after No. 9 seed Curbside Porter beat No. 1 seed Coco Jones Coconut Porter by a handful of votes, Airways founder Alex Dittmar stepped into his brewhouse. Brewers were texting family members, conducting interviews and watching themselves on YouTube when the familiar voice of Dittmar cut through the joyous din. “You people brew a helluva porter,” Dittmar probably said, pausing for a moment. “You just beat the best. 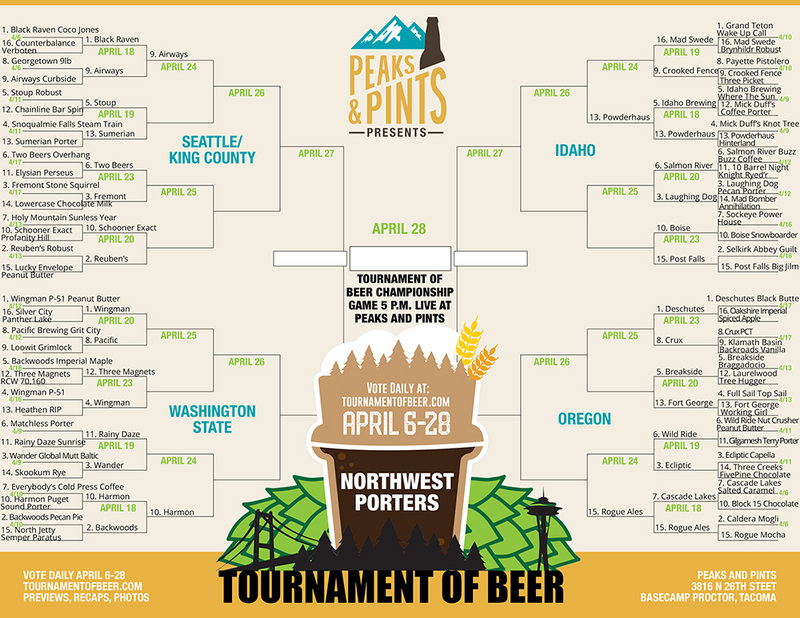 You should be proud.” This game will be the enduring legacy of the Tournament of Beer: Northwest Porters, etched in the record books as Curbside 50.42%, Coco Jones 49.58%. Epic. Ah, history. The factor we all owe so much but for the most part choose to ignore. Harmon Brewing Co. is still going strong after more than 20 years in the biz and its delicious flagship porter is one of many reasons for its continued success. When not chopping wood or baking delicious pizza, Backwoods Brewing brews award-winning porters. Both its Pecan Pie and Imperial Maple Porter were seeded into the tournament by public vote. That says a lot. The Harmon and its Puget Sound Porter put on a display of porter power, grabbing 70 percent of the vote and a slot in the Sweet Saccharification 16 round. Something tells Peaks and Pints that Backwoods will be OK. They’ll just brew another delicious porter. That’s what they do. The Sun is no longer shining. 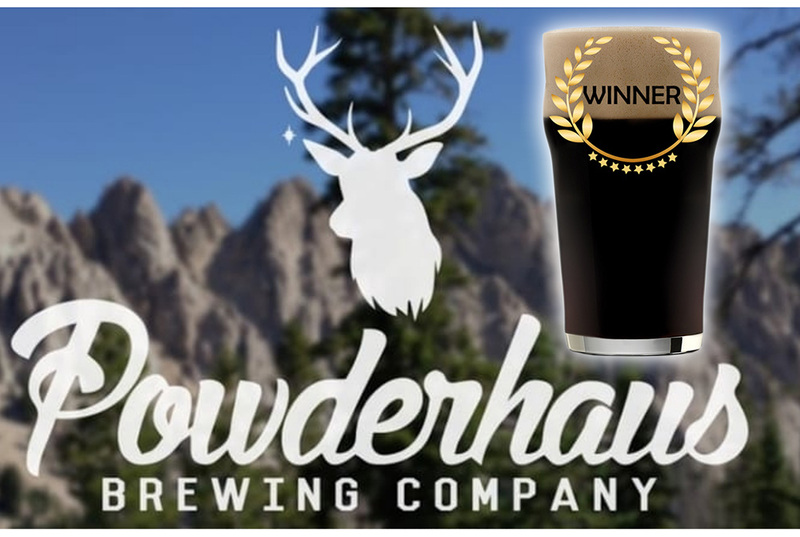 Idaho Brewing’s Where The Sun Is Still Shining Before the Eclipse porter saw the light and it looked a lot like Powderhaus Brewing’s rich and robust Hinterland Porter. The Garden City brewery snagged 59 percent of the vote and move on to the Sweet Saccharification 16 round. The Tournament of Beer Trophy Committee breathes a sigh of relief. They were not exactly sure how to fit “Where The Sun Is Still Shining Before the Eclipse” on the trophy nameplate. The Rogue Nation was founded in Newport, Oregon, ground zero for the craft beer revolution. Starting from humble roots with a handful of like-minded Rogue Ales drinkers, the Nation has grown strong with more than 270,000 Citizens worldwide, from Tokyo to London, Oregon to Florida. That’s a force to be reckoned with. 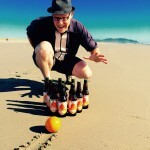 Rogue Ales kept a lead all day with ferocious play from their brewmaster, John Maier. Did Cascade Lakes Brewing’s über popular Pineapple Kush IPA distract potential Salted Porter voters. Hard to say. As the clock hit 11:45p.m., Rogue’s Mocha Porter had 56 percent of the vote, and a spot in the Sweet Saccharification 16. Malty, dark and medium-bodied, robust porters fall between subtler brown porters and full-bodied, higher-ABV Baltic porters. Robust porters exude roasty aromas from tan heads, while more roasty dryness and, sometimes, a slightly burnt flavor mark the taste. Two of the best robust porters take the court today. The Stoup Robust Porter’s complex malt profile includes chocolate malt, roasted barley, roasted wheat and roasted rye. Sumerian Robust Porter sports a strong roasted, robust malt flavor with a hint of chocolate. Fifty miles separates these two breweries. Less than 50 votes difference will probably be the winning number. Mad Swede Brewing’s Brynhildr Robust Porter took down the mighty Wake Up Call Porter Imperial Coffee Porter by Grand Teton Brewing in First Round action. This can’t be overlooked people. Grand Teton uses well over a pound per barrel of triple certified espresso beans from Caffe Ibis Coffee Roasting Co. in Utah. Now Mad Swede looks Crooked Fence Brewing’s 3 Picket Porter right in the middle picket. Brynhildr Robust Porter’s ample roast with a little bittersweet cocoa and modest floral hops has the goods top win. And it has Thor on its side. However, 3 Picket Porter is an approachable porter with a nice blend of chocolate and coffee notes and a subtle flavor of Northwest hops. It’s too close to call. Number six seed Nut Crusher Peanut Butter Porter sent former Portland Trailblazer guard Terry Porter’s namesake beer to the bench in First Round play. Peaks and Pints put a call into Clyde Drexler for a comment on the fall of Gilgamesh Brewing’s Terry Porter. Anyway, Wild Ride’s peanut butter porter has the greater Bend area backing, and the peanuts, to take of the Godfather of Porter, John Harris, and his Ecliptic Brewing’s Capella Porter. It might be time for humble Harris to hand out his porter pedigree. He’ll probably just study the recent data on the collision between Mars and a large asteroid that may have created the planet’s two moons, Phobos and Deimos. That’s so him.